Australia’s refugee politics is haunted by idioms. ‘Children overboard’, ‘stopping the boats’ and ‘deaths at sea’ surely qualify. But so too does the spectre of ‘wicked choices’. Under mounting pressure to transfer refugees from Nauru, created by pressing demands from medical professionals to attend to the humanitarian crisis in the centre, Scott Morrison announced last week that he might entertain a deal to transfer refugees to New Zealand if he could guarantee the passage of the ‘Lifetime Ban’ Bill. This was not the first time an Australian government had conjured a false dichotomy in order to advance its refugee policy. In 2013, the Rudd Labor government asked the Australian public to accept the re-opening of ‘regional processing centres’ on Nauru and Manus Island as an inexorable stop-gap measure to prevent deaths at sea. In 2014, during Scott Morrison’s tenure as Minister for Immigration, Parliament was asked to accept the re-introduction of Temporary Protection visas (TPVs) as the only means to commence refugee assessment of nearly 30,000 people, without sending a message to people smugglers that the ‘product’ of permanent protection had become available. In an environment inured to compromise, it is perhaps understandable that many commentators feel it’s necessary to accede to the ‘wicked choice’ offered up by Morrison, if it would mean the transfer of suffering people from Nauru to Australia. But just as there was nothing to tie ‘Regional Processing’ to safety at sea, or Temporary Protection to fair refugee processing, nothing logically connects the Lifetime Ban Bill with the imperative task of bringing those on Nauru and Manus to safety. The Migration Legislation Amendment (Regional Processing Cohort) Bill 2016 – now known as the ‘Lifetime Ban’ Bill – is not new. It was introduced and passed in the House of Representatives in November 2016. It was referred to the Senate Legal and Constitutional Affairs Legislation Committee, which reported on 22 November 2016. It has been awaiting vote in the Senate since that time. The purpose of the Bill is to expand already existing provisions under the Migration Act 1958, which bar (or ‘ban’) people who arrived by boat from validly applying for a visa. At present, people who arrived by boat, and those who were transferred to Australia from Nauru or Manus Island for medical treatment, are barred from lodging a valid application for any visa while they remain in Australia. If passed, the Bill would expand that bar to apply to any application made by a person who was transferred to Nauru or Manus – whether that application was made in or outside Australia. The only comparable bar which exists under the Migration Act relates to visa applications made by people removed from Australia following the cancellation of their visa under section 501 – the ‘character’ power. 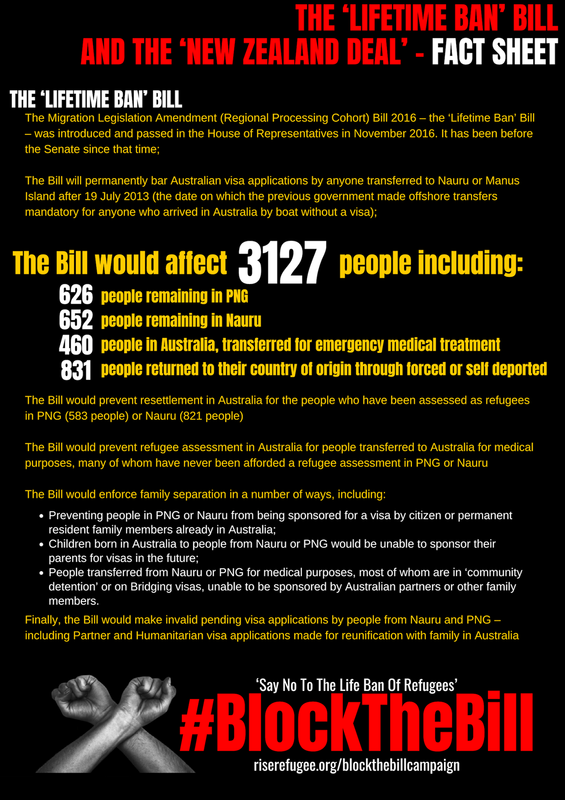 The Bill currently before Parliament would affect 3127 people – the number who have been transferred to Nauru or Manus Island after 19 July 2013, when the Rudd government made transfer to those centres mandatory for people who arrived by boat. Those affected include the 626 people remaining in Papua New Guinea, and 652 people on Nauru. It also includes the 460 people transferred to Australia for medical treatment. Finally, it includes the 831 people who have returned from the centres to their home countries, either ‘voluntarily’ or by force. The implications of the Bill cannot be understated. They are far broader than simply preventing recognised refugees from applying for Tourist visas in 30 years time, as was suggested by Labor in their initial opposition to the Bill. The first and most obvious consequence would be to prevent humanitarian resettlement in Australia of those people already found to be refugees – of whom there are 583 in PNG and 541 in Nauru. The Bill would also preclude access to refugee assessment by those transferred to Australia from Manus and Nauru, many of whom have not yet had access to meaningful assessment in either of those countries due to their compound medical conditions, and who have been systematically prevented from applying for protection in Australia pursuant to government policy. Any applications already made by people from Nauru or Manus (say, for Humanitarian, Partner or other Family visas) would be instantly invalidated – even if those applications were made before the Bill’s commencement. The Bill would also enforce family separation, in a number of ways. First, recent numbers suggest that 100 children have been born to people subject to detention on Nauru and Manus. Those children would not be subject to the barring provisions of the Bill, as they will be under 18 at the time of its introduction. If those children manage to secure an Australian visa in the coming years, they would be precluded from sponsoring their parents for visas to join them (a right available to every other permanent visa holder in Australia). Next, the Bill would have a dire impact on the 460 people transferred to Australia for medical treatment. Recent numbers suggest that all but 18 people from that group have been transferred into the Australian community – either through ‘community detention,’ or on Bridging E visas. Medical transfers to Australia have been taking place from the time the centres were opened – some people have been in the community for years. Like any other group, people transferred from Nauru and Manus to the community have built relationships, made families, some are living with their partners or are married. If passed, the Bill would mean that the family members of those from Nauru and Manus would be permanently precluded from sponsoring them for a visa to live in Australia. There is no reason to barter with the human suffering ushered by the Bill in the name of the ‘New Zealand deal’. First and foremost, the ‘deal’ is yet to take formal shape and exists only in assurances made first by Prime Minister Key and now Ardern to accept 150 people from the centres, with strong preference given to Nauru. In its highest terms, the deal presents a partial solution for Nauru – but not for Manus, or those stuck in limbo in the Australian community, or forced back to their home countries from the centres. But more to the point, the deal could be concluded at any time without the Bill – particularly in the context of widespread scrutiny of the health crisis unfolding in both centres, a hung parliament with crossbench opposition to the Bill and a damning loss for the Coalition in the Wentworth by-elections. On latest reports, Labor has begun to toy with support of the Bill provided that it was limited to barring applications by those transferred subject to the ‘New Zealand deal’. But there is no obvious way the proposed bar could be written down in these terms. And there should be no reason to ease the pressure that the Coalition have finally begun to feel on their ‘no advantage’ policies that trade on human suffering as a symbol of border protection. The history of Australia’s refugee policies – from the 1990s when mandatory detention was introduced as a supposedly temporary measure – shows that compromise can never be walked back. Those held on Manus and Nauru must be evacuated from the humanitarian emergency of Australia’s creation – not on conditional, but rather on unconditional and immediate terms. 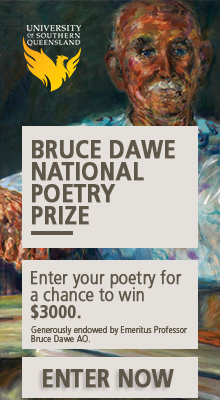 This is the first moment since the opening of those centres that this has seemed possible. Sanmati Verma is an immigration lawyer and writer. She has volunteered with the International Student Legal Advice Clinic and the immigration unit of the Legal Aid Society, NYC. She now works with the National Union of Workers and the Migrant Workers Centre on workers’ rights. What a beautiful piece…Well done Sanmati! Till recently, I thought the human heart was made of the same matter…I wonder which matter the politicians hearts are made of? How can we continue to rejoice the human sufferings! It is beyond me. Rudd did not re-open Nauru and Manus in 2013, they were re-opened by Gillard in 2012. This is an excellent piece. I recently saw Rudd condemning the Liberal’s refugee policy on his Facebook recently – scoffed hard. Keep up the good work. Have we Wadjelas forgotten that our families typically arrived by boat? Personally I was a boat person in 1974 and I was welcomed to enter Australia and stay as long as i wanted to. Lets ask the first peoples how we should treat boat people.